ARIES: You may notice how a person’s face looks when they are truly spiritual, how their sense of peace is reflected in what someone looks like. Risk taking is highlighted this month either in you or someone close to you, but please remember expectations! It is important not to expect too much or someone’s ego could be bruised. Things will tend not to work out the way you or others thought they should. This month also features the idea of paying for something in payments or pieces. TAURUS: There are many serious things going on right now. It is important to remain compassionate but be wary that you are not put in a humiliating position. Things feel fated and testy as a result of things getting so out of control. Watch out for addictive behaviors! This month also features taking care of yourself and listening to those who give advice. There could also be some realization regarding what are necessary evils in life however they won’t keep you from finding peace this month. GEMINI: Take the plunge! As this is your month, there should be a greater sense of security in yourself. Perhaps you are aware of the concept of “just rewards” ? This can be good for you. Whatever you decide this month could be the beginning of a whole new year for you. Do be careful of your health and promptly take care of any health matters . Listen to your own inner voice before you act. Energy levels should be good to help you with whatever you chose to go after. Be alert that you are not continuing patterns of behavior that can be self-destructive. CANCER: The fact that something or someone is out of control can be an issue this month. This can extend to the point where you or others are feeling stuck from that lack of control. However, you could be gaining information that you did not previously have that can help you get to the bottom of things, even things that are out of control. Things can be so crazy and scattered this month! Sleep issues are possible due to pain, so be wary. Be aware that you may be giving or getting help in the eleventh hour of a situation. LEO: The lesson this month might be boundaries, particularly with those who are closest to you. You will also be aware of how having a negative attitude can be very self-destructive. Being fair or the idea of fairness will come to your attention. Some things just seem to go slowly in our lives. It is as if a person needs to experience something more than once to get it. This is a good month to focus on work or goals. Some expenses or dependencies will come to your attention. You may also find that an expense can make people feel they are being held for ransom. 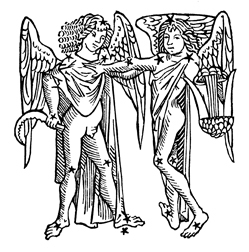 VIRGO: Trying to delegate duties to others this month does not seem to work out very well. There is something sad going on either with or through others. People are on their own personal journey—a journey that each one of us can only do on their own. It may be important for you or others to withdraw and take some time away from the hustle and flow of life. It is also a good idea for people to protect themselves and listen to their intuition. Your intuition is highly attuned this month. Boundaries and setting good boundaries will be very important to you now. LIBRA: You could be feeling a great deal of pressure this month which could make you or others evasive. You might hear or even say the words “My God, why me?” as a result. Taking some time for yourself will be good now. There could be some kind of complaint, grievance or loss related to money. Use restraint with regard to money and try to be prudent. Take heart however, there will be victory in all that is going on. This month is also about understanding how money and the pursuit of making money can be very self-destructive. SCORPIO: Logic and planning are very important with regard to new beginnings. Body awareness and taking better care of your body could be featured. It might be a great time to take up yoga! This month features bonding with people who may not be too credible, or of questionable character, and perhaps there is a great deal of intrigue about these connections. Watch for over-reactions, especially in the area of work/goals. Working too much or over-reactions at work can cause their own destruction. SAGITTARIUS: Body awareness will be a focus whether your own or someone else. Ironically, having more attention paid to health might upset your routine. Things could feel scattered right now. This is a good time to get up early to exercise and start your day in your favor. It will come to your attention how pretending can be another form of self-destruction. Right now, it will be difficult to be very productive due to feeling as if it is all just a little too little and a little too late, even the idea of going away will have some kind of restriction. CAPRICORN: This month try to be good to service people. There could be more clarity this month—even windows will come to your attention. Health matters might plague you this month. Situations involving on clearing or cleaning things up will not easily be resolved. Expenses as well as your status within a relationship could be changing. Many changes and transformations are going on that will eventually empower you. But for now, you are dealing with difficult memories. Smiling might simply be ornamental right now rather than how you feel. AQUARIUS: People can be evasive, particularly in the evening. There is a great deal going on that will require some restraint. There could be some pretending about financing or finances in general. It does look as though this will work out well. It will be exciting to have problems resolved, particularly those related to a health problem. Be cautious, as it will be important not to be tempted to push beyond the limits and test those boundaries. So much is going on you may feel oppressed at times. PISCES: Listen to your gut when it comes to money matters. It will be difficult to speak up or speak out at times when it comes to compassion and sympathy. There could be the question “are things truly what they seem?” It will be important to pay close attention this month. Keep your feet firmly planted on the ground. Interruptions and disruptions tend to cost money this month. Watch the way someone looks when they get paid. It will show you much. Not all the information is available yet so there may be much you still don’t know.